I’m a fan of Thanksgiving food in all forms. I love it when Mrs. Crappy suggests having mini-Thanksgiving in the middle of the winter. I wake up in the middle of the night craving turkey and stuffing smothered in gravy. Waffles, INCaffeinated’s South Side store has a lovely special this month called the Gobbler. Their description: “The foundation is a waffle infused with turkey, fire-roasted and paired with butternut squash. Drizzled with a blueberry, ginger, and cayenne foam; finished with pecans and toasted fluff.” I honestly think that the thing I was most skeptical about — the marshmallow fluff — is the thing that makes it. Mad Mex offers what I had previously considered to be the alt-Thanksgiving Holy Grail — the Gobblerito. A gigantic freaking tortilla loaded with turkey, stuffing, corn and mashed potatoes, doused in gravy and served with cranberry sauce? Yes, please. And then there is what I ate at Piper’s Pub last night. 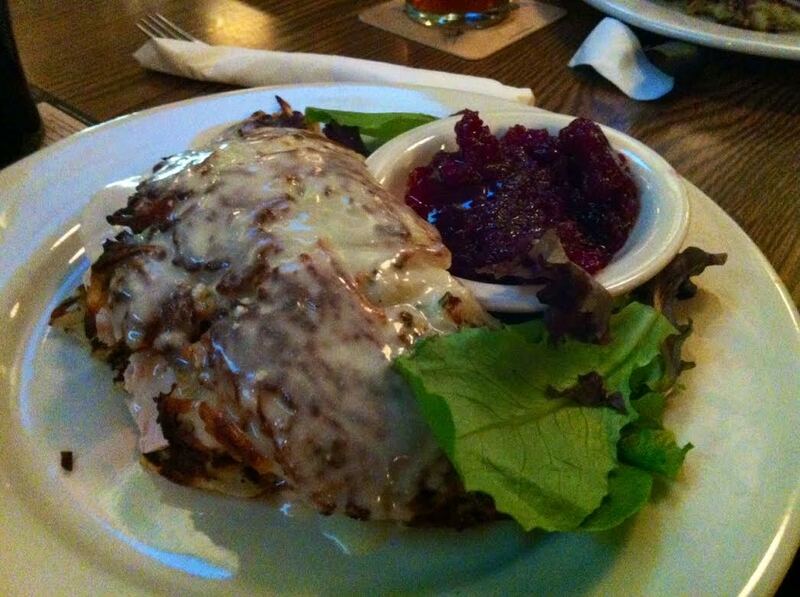 To start, we have the boxty: a delicious potato pancake covering, uh, pretty much anything. And when that anything is turkey, stuffing and carrots — and covered with gravy — you have a Thanksgiving boxty, which is that beautiful thing pictured above.. You also have perfect — I love the Gobberito, but the fried potato worked a lot better than a tortilla. Without question, the best practice Thanksgiving meal I’ve ever had. Sure, there’s a full Thanksgiving meal coming up in a few days — but I wonder if I can talk Mrs. Crappy’s cousin into trying this boxty thing out instead. i wholeheartedly agree that the thanksgiving boxty at piper’s is the best thanksgiving inspired meal i have ever consumed. considering how much i thought i loved the gobblerito, this is saying something! Previous PostPrevious 19. mornings are hard. Next PostNext 21. fifteen hundred. and a couple more.